Francis began a cycle of catechesis dedicated to the "Our Father", highlighting how Jesus was "a man of prayer". "Even if we have been praying for so many years, we must always learn!". "And we do not even know if the prayers we address to God are actually those that He wants to hear." 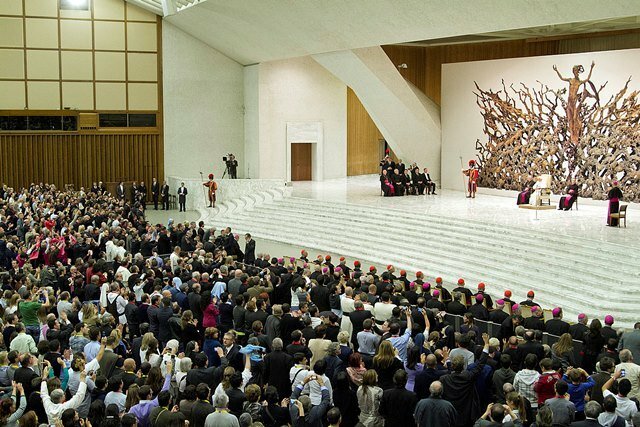 Vatican City (AsiaNews) – Learning to pray from Jesus who in his earthly life has always shown the need to stand in solitude and pray, because "even if we have been praying for so many years, we must always learn!". "And we do not even know if the prayers we address to God are actually those that He wants to hear." Learning to pray from Jesus, as the apostles asked, was the subject of Pope Francis’ general audience today, with which he initiated a cycle of catechesis on the "Our Father". "The Gospels - he said - have given us very vivid portraits of Jesus as a man of prayer. Despite the urgency of his mission and the urgency of so many people who demand his time, Jesus feels the need to seclude himself in solitude and to pray. The Gospel of Mark tells us this detail from the first page of the public ministry of Jesus (cf. 1: 35). The inaugural day of Jesus in Capernaum ended triumphantly. When the sun goes down, multitudes of sick people come to the door where Jesus dwells: the Messiah preaches and heals. The ancient prophecies and expectations of so many suffering people are realized: Jesus is the God at hand, the God who liberates. But that crowd is still small compared to many other crowds that will gather around the prophet of Nazareth; at times it is about oceanic assemblies, and Jesus is at the center of everything, expected by the people, the outcome of the hope of Israel. Yet he disengages himself; he does not end up hostage to the expectations of those who have now elected him as their leader ". "Jesus tells his family that he has to go elsewhere; that it is not people who seek Him, rather He who first and foremost seeks others. So he should not take root, but remain continuously a pilgrim on the roads of Galilee (verses 38-39) ". And "in some pages of Scripture" it seems to be precisely "the prayer of Jesus, his intimacy with the Father, to govern everything". This is what happens on the night of Gethsemane, the last part of his journey, the most difficult, which "seems to find its meaning in the continuous listening that Jesus gives to the Father". "Here is the essential point: there, Jesus prayed. Jesus prayed intensely in public moments, sharing the liturgy of his people, but he also sought places, separated from the whirlwind of the world, places that allowed them to descend into the secret of his soul: he is the prophet who knows the stones of the desert and climbs high into the mountains. The last words of Jesus, before his last breath on the cross, are words of the psalms ". "Jesus prayed as every man in the world prays. Yet, in his way of praying, there was also a mystery, something that certainly did not escape the eyes of his disciples, if we find in the gospels that simple and immediate supplication: "Lord, teach us to pray" (Lk 11.1 ). And Jesus does not refuse, he is not jealous of his intimacy with the Father, but he has come precisely to introduce us to this relationship. And so he becomes a teacher of prayer for his disciples, as he certainly wants to be for all of us ". "Even if we have been praying for so many years, we must always learn! The prayer of man, this yearning that is born so naturally from his soul, is perhaps one of the most dense mysteries of the universe. And we do not even know if the prayers we address to God are actually those that He wants to hear. The Bible also gives us testimony of inopportune prayers, which are eventually rejected by God: just remember the parable of the Pharisee and the publican. Only the latter returns home from the temple justified, "for whoever exalts himself will be humiliated, whoever humbles himself will be exalted" (Lk 18: 14). The first step to pray is to be humble, go to the Father and say: 'But, Father ...', go to Our Lady: 'But look at me, I am a sinner, I am weak, I am bad ...', everyone knows what to say. But always start with humility, and the Lord listens. Humble prayer is heard by the Lord. Therefore - he concluded - beginning this cycle of catechesis on the prayer of Jesus, the most beautiful thing that we all have to do is to repeat the invocation of the disciples: 'Master, teach us to pray!'. He certainly will not let our invocation fall into the void ". "From the many things - so often difficult - of life - he added, turning to the Portuguese-speaking faithful - learn to lift the heart up to the Father of Heaven, resting in the bosom of his infinite goodness, and you will see that the pains and afflictions of life they will do you less harm. Nothing can prevent you from living in this friendship with God and witnessing to all his mercy! " 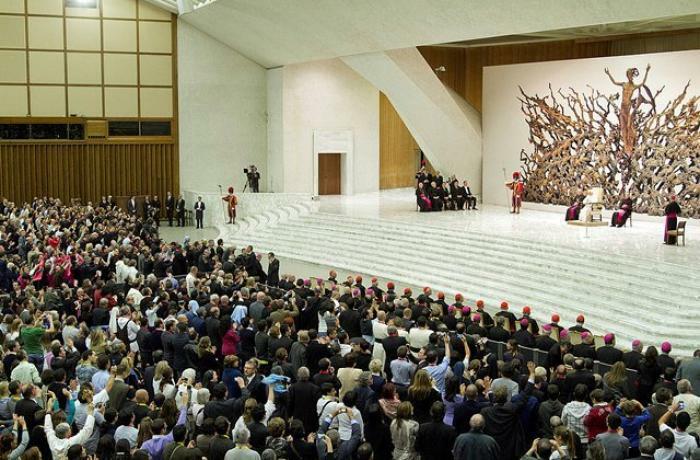 Pope: the "bread" that we ask of God is not "mine", but "ours"